Press and off-line installations are available. Install the Vista on your folder/gluer and achieve a productive, new approach to carton windowing. You save floor space, simplify scheduling, and streamline operations. Self-contained drive system provides clean integration into your new or existing folder/gluer. No lugs! 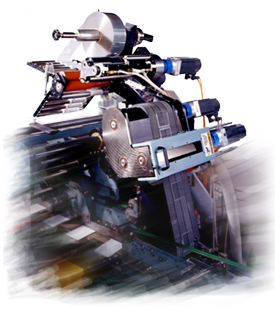 Scanning system and servo technology provide on-demand gluing, cutting, and affixing: no windows are applied when cartons are not present due to variations in carton blank spacing, misfeeds, or an empty hopper. Cleanly cut and affix difficult materials like brittle acetate or stretchy polyethylene with Vista’s patent-pending cutting system. Fast set-up and hands-off operation allow your operator to focus on folding/gluing. Vista’s instructional touchscreen control, electronic size change, efficient glue fountain, quick change bars—and more—save operator time and attention. Glue applicator features provide the quickest clean-up in the industry. Vista components perform on-demand to affix a window to each carton blank. Your operator enters job information, including window length and carton dimensions, using the touchscreen control. 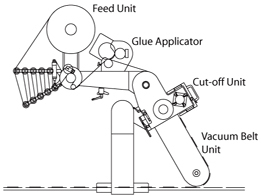 Window material from a roll is metered by the feed unit to the glue applicator. The glue unit prints an attractive, cold glue pattern directly on the window film, and routes the window film to the cut-off unit and vacuum belt section. The cut-off unit cuts the window film to length between glue patterns, and the vacuum belt unit applies each window patch in registration to the carton blank. Operator interface Menu-driven touchscreen control.